Not everyone wants, needs, or is willing to pay for the top-of-the-line tri/quad stream 802.11AC Wi-Fi router. For those who fall into that category, but still want modern features like MU-MIMO the ASUS RT-AC58U might be just the thing. It is launching at the end of September, but price hasn’t been disclosed yet so we’ll have to wait and see it where this falls in the value-for-money spectrum. Update: I was able to run down pricing (£89.99), but unfortunately is now delayed until December. Taipei, Taiwan (23rd August, 2016) — ASUS today announced RT-AC58U, a dual-band 802.11ac Wi-Fi router featuring AC1300-class combined concurrent speeds of up to 1267Mbps. RT-AC58U addresses the common problem of Wi-Fi congestion in the home caused by a proliferation of connected devices, with a design that delivers improved performance and range for busy home networks in multi-device households. It features four external high-gain antennas and supports the revolutionary multi-user MIMO (MU-MIMO) technology, which works with compatible MU-MIMO devices to allow multiple devices to operate simultaneously at their maximum possible speed. A powerful quad-core processor combined with 128MB of fast DDR3 RAM gives RT-AC58U superior multi-tasking capabilities and the ability to deliver smooth and responsive performance for bandwidth-intensive tasks such as 4K UHD video streaming. ASUS RT-AC58U is an ideal choice for busy multi-device home network environments, combining advanced technology and powerful hardware to ensure fast, reliable connections for all devices. The revolutionary MU-MIMO technology in RT-AC58U helps improve overall network performance when MU-MIMO compatible devices are connected, allowing multiple compatible devices to operate simultaneously at their maximum possible speed without slowing down the network. The 128MB flash memory and 128MB of fast DDR3 RAM also help maximize the number of devices that can be connected at the same time. 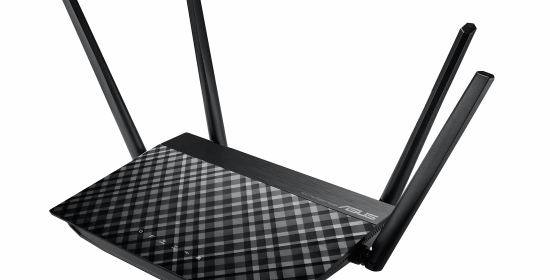 ASUS RT-AC58U gives users the convenience and speed of dual-band Wi-Fi, with concurrent speeds of up to 400Mbps on the 2.4GHz band and 867Mbps on the 5GHz band giving a total combined bandwidth of 1267Mbps. A quad-core A7 processor helps reduce bottlenecks between the internet and the home network, optimizing internet connections and allowing smooth multi-tasking. It has more than enough power to cope easily with bandwidth-intensive multimedia tasks such as 4K UHD video streaming. RT-AC58U has excellent wide coverage that minimizes Wi-Fi dead zones around the home, helped by four external high-gain (5dBi) antennas with an ASUS-exclusive design and layout. Additionally, ASUS AiRadar beamforming technology focuses the Wi-Fi signal in order to minimize interference and improve signal strength. The USB 3.0 port on RT-AC58U allows users to access files stored on USB 3.0 storage devices up to 10 times (10X) faster than is possible with USB 2.0. ASUS RT-AC58U will be available by the end of September in the UK from leading UK retailers. Please contact your local ASUS representative for further information.